Compared to the usual jellyfish they are fast, agile swimmers who are aware of their surroundings and will react accordingly. 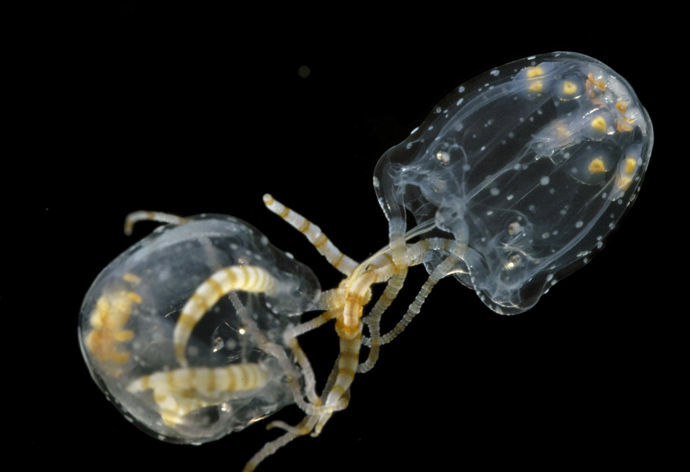 Box Jellyfish are in fact in a class of their own. It's called Cubozoa, and it's distinct from the true jellyfish class (Scyphozoa) and the other two main groups which contain hydroids and corals/sea anemones. 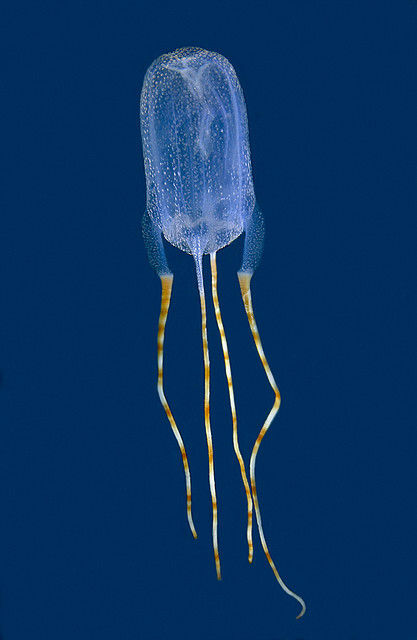 As you've probably gathered by now, Box Jellyfish are a bit square. They look like transparent, gelatinous cubes swimming around in warm, marine waters across the world. This is quite a departure from the usual environment of gelatinous cubes. On each of the lower four corners of the Cubozoa there is a fleshy, muscular pad called the pedalium. It's from this that the tentacles dangle, each one bristling with hundreds of thousands of cnidocytes that fire those tiny, barbed and venomous harpoons members of phylum Cnidaria use with such aplomb. The 40 or so species of Cubozoa are split into two families which are most easily told apart by the number of tentacles they have. Most carybdeids have just one tentacle on each pedalium, though there are some with two or three. Chirodropids, on the other hand, may have a dozen or more. The tentacles can be retracted when not in use. The biggest Box Jellyfish in the world is Chironex fleckeri; it's bell can grow to almost 30 cm (a foot) across and the tentacles that trail from it can reach 3 metres (10 feet) long! But that's only when they're trying to catch a bite to eat. If they just want to swim somewhere they can pull those tentacles in until they're a mere 15 cm (6 in) long. On the other side of the scale is our old friend the Irukandji Jellyfish. Those guys only reach the size of a thumbnail! And just to show that size isn't everything, both Chironex fleckeri and the Irukandji Jellyfish have killed people with their stings. When it comes to love and war - or love and killing people with toxins - it's not about size, it's about chemistry. Chironex fleckeri in particular has chemistry that can cause cardiac arrest within minutes. This is why they're so often called "the most venomous animal in the world RUN! For the love of God, RUN!" Thankfully, even "the most venomous animal in the world RUN! For the love of God, RUN!" doesn't actually kill all that many people, maybe about 100 in the last 100 years. It only gets really dangerous when someone is stung a sufficient number of times, and for that they have to be in contact with a whole lot of tentacle for quite a long time. People tend to avoid that situation if at all possible, so most cases of envenomation are not fatal. 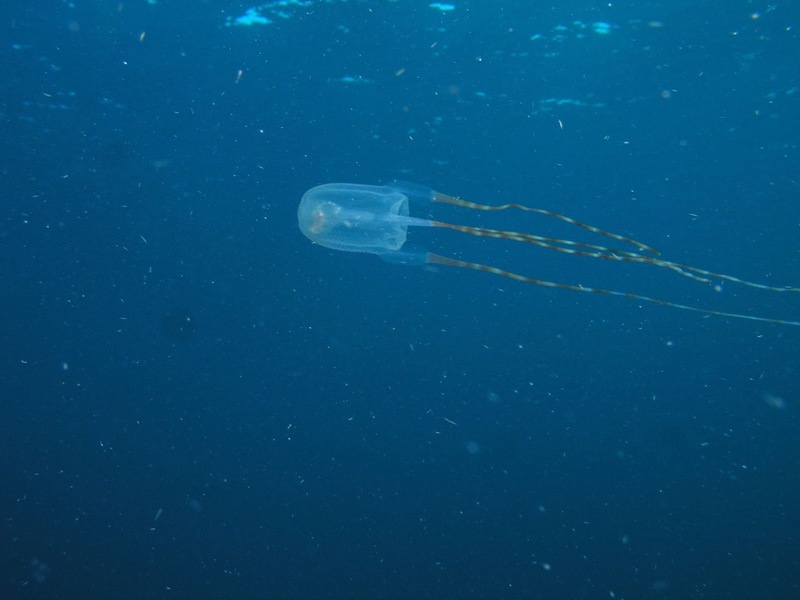 It also happens to be the case that most Box Jellyfish are not potent enough to kill away. Of the ones that are, almost all come from Indo-Pacific waters. Presumably this is because that's where Australia is, and Australia seems to be a kind of international convention centre for practitioners of the the venomous arts. 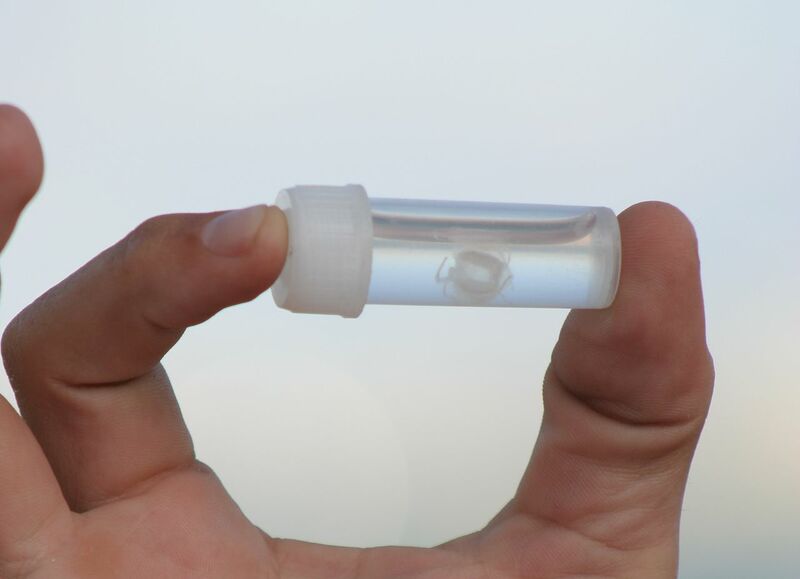 When it comes to not getting stung, part of the problem with Box Jellyfish is that they're so difficult to see. They're almost entirely transparent, after all. Interestingly enough, another part of the problem may be their difficulty in spotting us! Cubozoans have eyes. Not just eyes, but complex eyes with a retina, cornea and a lens. Also there are 8 of them! Two for each face of the cube. Err... excluding the top face and the bottom face, I mean. Each eye is part of a structure called a rhopalium, which dangles down on a stalk and is contained within an indentation, a niche in the bell. Each rhopalium contains the eyes, a statocyst, which is an organ that helps tell up from down, and... a bunch more eyes! Box Jellyfish have a total of 24 eyes: 8 simple slit eyes, 8 simple pit eyes, and 8 complex, lensed eyes of two different kinds. The simple ones do simple things like distinguish light from dark. 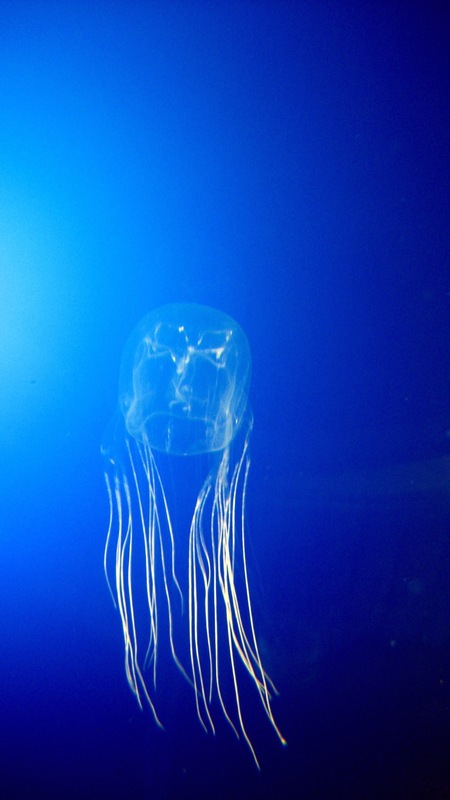 Even a few ordinary jellyfish are endowed with that much, but only Box Jellyfish have lenses and retinas and corneas. They are the most complex eyes in cnidaria. They also point in different directions so that with the way they dangle on their stalk and with the Box Jelly's transparent body, they can see in just about every direction at once even if they have to look right through themselves! 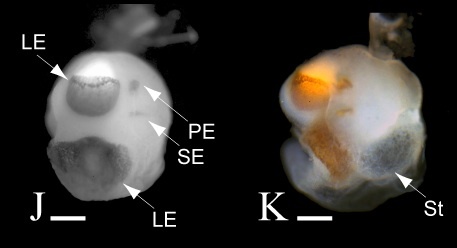 And this raises the question of how exactly the Box Jellyfish sees what its eyes can see. I don't mean if they have a tiny Box Jellyfish sitting in the rhopalium watching everything on a cinema screen. 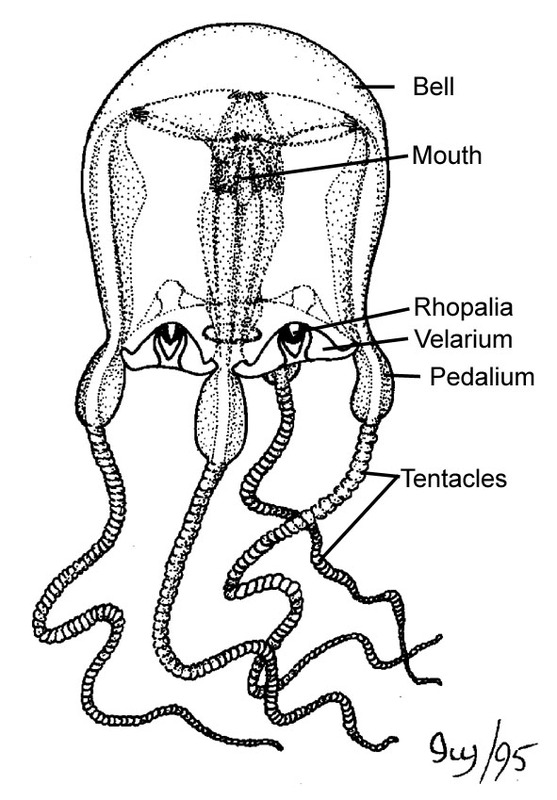 The thing is, Box Jellyfish don't have a brain. They do have a more complex nervous system than a normal jellyfish, but it's not clear how they use it to actually perceive what their eyes are seeing. It's also not clear how good their eyesight really is. In any case, now we have a Cubozoan that can see stuff to some extent and is capable of swimming around and avoiding obstacles. One of these obstacles may be a huge, moving pillar called a human. 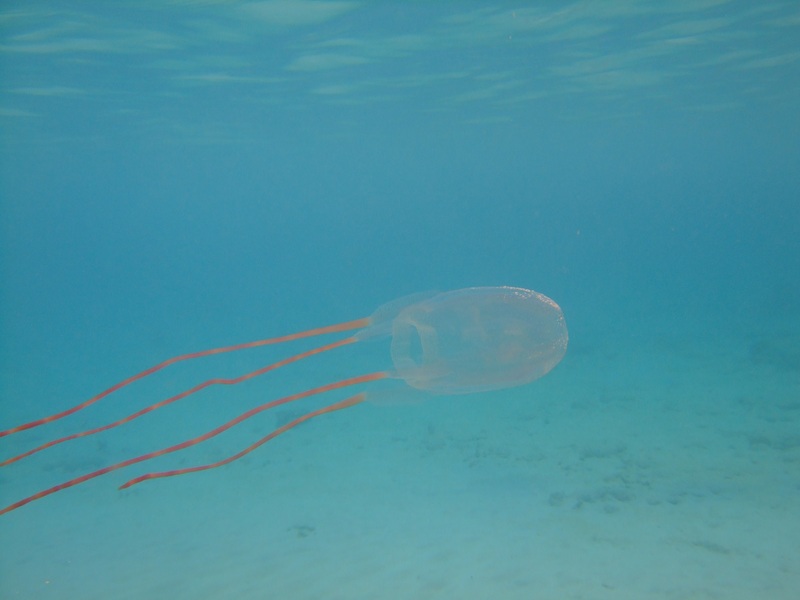 At best this is an annoyance to get around, at worst it's a vicious predator who threatens the Box Jellyfish's life. Either way the solution is clear: avoid. However, at least one person in the world has suggested the possibility that people with lighter skin could be more difficult for a Cubozoan to spot than people with darker skin. This would mean they're less likely to conduct evasive manoeuvres and are more likely to bump into them. Basically, white people be like... getting stung by jellyfish. I don't know how much truth there is to that, but I do like the idea of a Box Jellyfish talking to his chums about how a massive human "came out of nowhere" and "I just had to sting it and get the hell out of there!" Of course, what Box Jellyfish really want is food. Box Jellyfish can actually hunt and chase after prey since the space under their bell is constricted by a load of flesh known as the velarium. Since they swim by pumping water out through this space, the velarium provides them with a more powerful jet propulsion. On the other hand they can also just swim to the surface and then allow themselves to sink, their tentacles flaring out to catch copepods and such from the water. Whatever's on the menu, those tentacles are used to grab hold of it and sting them mercilessly in the process. Then the tentacle can retract to draw in their catch. The pedalium, that fleshy pad that the tentacles are attached to, bends to shove the tentacle up into the bell. The mouth is up in the bell and situated at the end of a flexible tube called the manubrium which worms and squirms its way over so that the mouth can engulf prey. The underside of their bell is partly covered by a bit of flesh called the velarium. This simply constricts the opening through which water is pumped out, creating a more powerful jet-propulsion system so that Box Jellies are faster and more agile than normal jellyfish. And after a hard day's hunting, it's time for some kip. 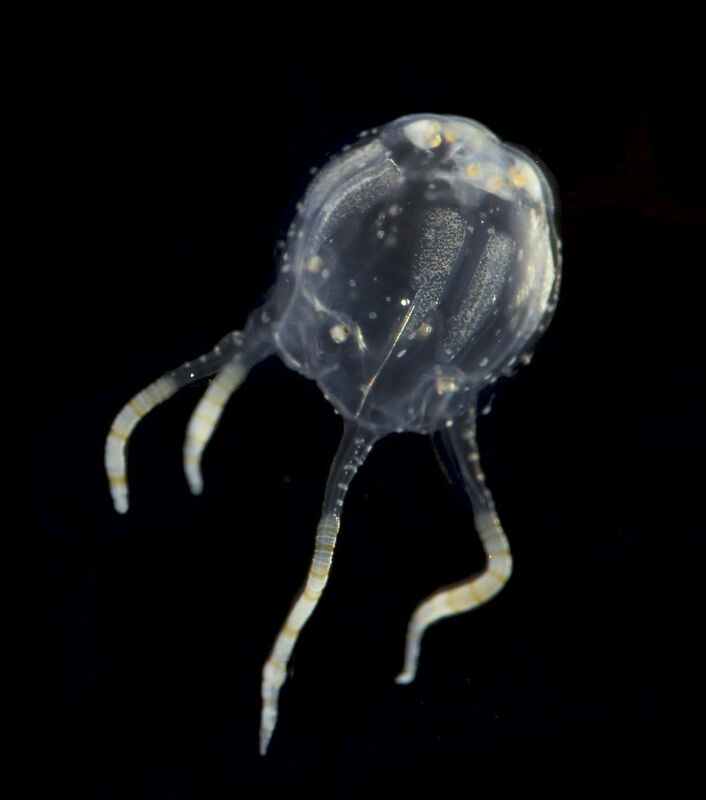 Box Jellyfish have been seen spending the night on the sea floor, completely motionless. They seem to be sleeping! (pdf) One study showed that Chironex fleckeri, spends up to 15 hours of the day asleep. I guess that's what happens when you have 24 eyes. It's complicated, though, since other specimens in a tank didn't sleep for 9 whole months! Apparently the amount of sleep they require is heavily dependant on the individuals experiences. Living a complicated, difficult life chasing after prey, escaping predators and bumping into humans necessitates a lot of time asleep, organising and processing those memories. Life in a tank with their food handed to them on a silver platter? Not so much. Imagine if humans were like that! We could live simple, uncomplicated lives doing simple, uncomplicated things which would mean we could stay awake for months at a time and do even more simple, uncomplicated things. Just think of how many simple, uncomplicated things we could get done! But... what if humans ARE like that? What if we just fill up our lives with whatever amount of difficulty and complication is required to make us need 8 hours sleep! Speaking of which, it seems that most Box Jellyfish mate by releasing their sperm and eggs into the sea, same as most cnidarians. However, at least one Cubozoan has a rather more complicated mating ritual than that. Males of the species Copula sivickisi use a tentacle to grab hold of a female and drag her around the place. Eventually they entwine and their manubria get close. The manubrium is that tube thing that has their mouth at the end, remember? Actually that "mouth" is their one and only, multi-purpose orifice. So when the male produces a packet of sperm and hands it to the female, up the manubrium it goes. Fertilised eggs hatch into the planula larva, a tiny, pear-shaped blob with swims around using cilia. It descends to the sea floor and develops into a polyp, which is like a little sea anemone that catches food with its tentacles. It reproduces asexually by budding off clones of itself that crawl away to start new lives of their own. Eventually, each polyp metamorphoses into a miniature Box Jellyfish that swims off to live on the high seas. They already have a twinkle in their crafty eyes! some are beautiful. some look creepy and ghostly! @TexWisGirl: Yeah, they're very spooky! @Crunchy: Not something you see every day!